Elegant newly constructed home with 3 bedrooms and 2 1/2 bathrooms in a highly desirable neighborhood in San Luis Obispo. Close to shops, parks, hiking trails and downtown. You walk into a large great room with French doors to a deck and beautifully landscaped backyard. The large, stylish kitchen includes quartz counter-tops, subway tile back-splash, stainless steel appliances, quality cabinets with tons of storage and a large kitchen island with bar seating. Living room area has a modern fireplace with stone surround and reclaimed wood mantle. Home has forced-air heat and air conditioning - perfect timing for those hot summer days on the way. Upstairs you'll find three bedrooms, two full bathrooms and a laundry area with storage and built-ins. The master-bedroom includes a large walk-in closet and en-suite bathroom with elegant finishes. High-end laminate wood flooring throughout home. The fenced back and side yards have a fire-pit area, large entertaining deck, grass area and nicely landscaped touches throughout. Beautiful mountain views from upstairs bedrooms and backyard. 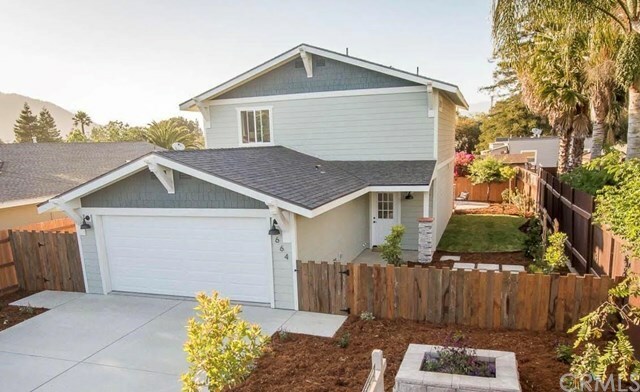 This is a rare find: a beautiful, new home in a great San Luis Obispo neighborhood. It won't last long! Directions: Broad to Woodbridge. House is on your right.